Unreal Sugarbush Views & Location! Come and enjoy all that Central Vermont and the Mad River Valley have to offer. Ski, snowboard, or snowshoe all in one day. 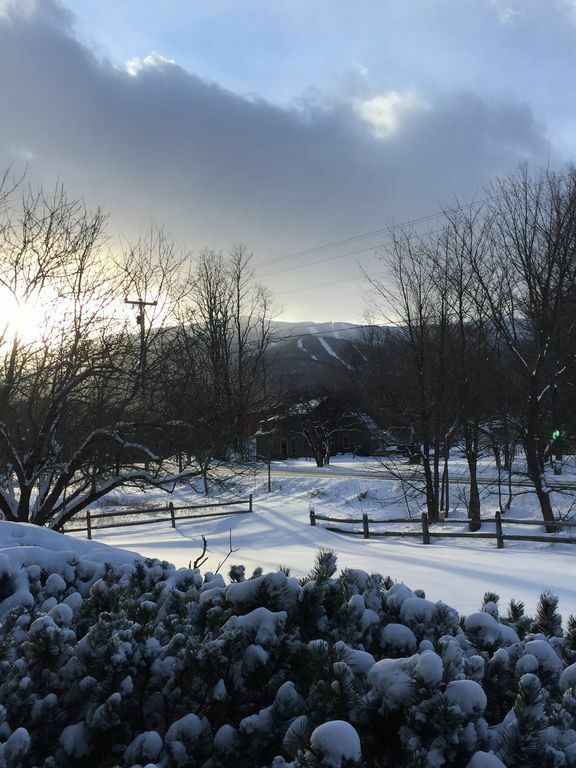 Three prestigious ski resorts are all within a few miles of the house, Sugarbush North, Sugarbush South, and Mad River Glen. This Non-Smoking house is well appointed with all the contemporary luxuries you would ever need. It has hardwood floors, an open and bright floor plan, and a spectacular view of a rustic barn, a brook and Sugarbush North from the living room. You can make meals in your own kitchen, have coffee or hot chocolate by the fireplace enjoying mountain views. You can snowshoe or Nordic ski on the property after a day of skiing or riding or just go for a winter hike over the bridge at the end of the property onto the Mad River Path/Catamount Trails. If you wish, explore the area's covered bridges, cider mills, wineries, museums and shops. The villages of Warren, Waitsfield, Waterbury and Stowe are just minutes away. Take a tour of the Ben and Jerry's Ice Cream factory, see how delicious Lake Champlain Chocolates are made, or sample cheeses at the Cabot Creamery. You may enjoy a tour of the Vermont Teddy Bear Factory just as much as the kids! Very comfortable, perfect for a romantic Vermont getaway or a family vacation. This is our family get-away that we are willing to rent to other responsible families. WEEKLY RENTALS ONLY, NO SEASONAL RENTALS. Great view of Mount Ellen from the front yard and living room. Gas insert- just flip the switch and enjoy the lovely ambiance and warmth. Assorted spices, salt, pepper, some kitchen staples like flour and sugar. We had a great ski getaway with our family. The house was perfect- clean, great kitchen for cooking, fireplace for relaxing after our great days skiing, lots of games for the kids. House is an easy drive to Sugarbush and not needing four wheel drive to get to the house was a bonus. Recommended to our friends due to location and comfort of home. We enjoyed dinner at The Hyde Away restaurant, just down the road (sweet potato fries and delicious & local brews on tap). The skiing was great, much better than last year!! Enjoy Nordic skiing, snowshoeing and winter hiking directly out the back door!